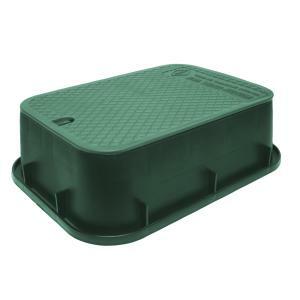 This large rectangular valve box measures 15" x 21" x 6" and has green base and green lid. Valve boxes with lids protect your valve manifold systems while allowing easy access to valves and/or fittings that are placed underground. Made of High Density Polyethylene (HDPE) for strength and good chemical resistance. All Dura Valve Box products carry a SCTE Static Vertical Load Rating of "Light Duty Pedestrian" and are not rated for vehicle traffic. Dura products are proudly made in the USA.